George Teasdale was born in London on December 8, 1831, to William Russell and Harriet Henrietta Tidey Teasdale. Teasdale was studious in nature. He obtained the best education that could be had at the public schools and the London University. He first worked for a surveyor and architect, and later he learned the upholstering business. His mother was devoted to the Church of England (Anglican Church), but George could never fully commit himself. However, he did study the scriptures and learned much about the kindness and basic tenets of Christianity from his mother. In 1851 George procured a tract issued by the Tract Society of the church of England, entitled "Mormonism." This was the first he had ever heard of The Church of Jesus Christ of Latter-day Saints. Shortly afterwards, a Mormon was hired at the same workplace that employed George Teasdale. The man was plain and unassuming, but strong in his faith and unashamed to bear testimony of the "restored gospel" to his fellow employees. He was ridiculed for this, but Teasdale was moved by his witness. Teasdale was baptized on August 8, 1852, and immediately tried to share the truths he had learned. He was treated with disdain by most, but he still invested much of his time in preaching, relying on the Holy Ghost to overcome his natural difficulties with public speaking. By 1858 Teasdale was presiding over three conferences. In 1859, he was put in charge of the Scottish LDS Mission, which included the Edinburgh, Glasgow, and Dundee conferences. In 1861 he was released to emigrate to Utah in the United States. Of Teasdale's four children, two were already deceased. The impoverished family could only afford the "steerage" quarters in the belly of the ship, and Teasdale fulfilled so many duties helping with the group of immigrants, that he didn't reach the Salt Lake Valley until Sept. 27, 1861. Once in Utah, Teasdale taught school in Salt Lake City. He also sang with the Mormon Tabernacle Choir. In 1862 he was commissioned to take charge of Brigham Young's general store. In 1867 he took charge of the General Tithing Store. In 1868 he was called on a mission to England. In England he worked in the Millennial Star publication office, and he helped with the migration of the British Latter-day Saints. He returned to Utah in 1869. After his return, he worked for ZCMI (Zion's Cooperative Mercantile Institution, taking full charge of the produce department. 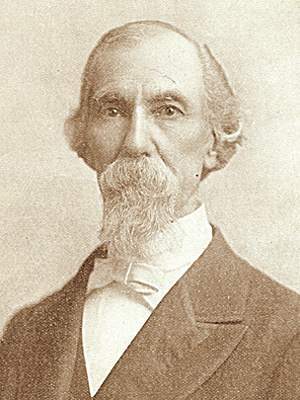 In 1875 he was appointed on a mission to the Southern States, and labored in Tennessee, North Carolina and Virginia, returning again to labor at ZCMI. Being called to the charge of the Juab Stake of Zion, he was ordained a High Priest and set apart for this position under the hands of Pres. Brigham Young. This caused him to resign an excellent position in ZCMI, but he soon found suitable ways and means by which he could comfortably sustain his family (Teasdale participated in the practice of polygamy). While living in the town of Nephi, he was engaged in the tithing office, took contracts for the construction of a portion of the Utah Southern Railroad, acted as president of the Nephi Co-operative Store, and was also connected with other enterprises. He also served in two sessions of the Utah legislature, namely those of 1880 and 1882. In 1882, George Teasdale was called to be an apostle of the LDS Church, and he was ordained to that position on October 13, 1882, by President John Taylor. He served a six-month mission in Indian territory. After serving in many other capacities, Teasdale was called back to Europe, arriving in Liverpool on November 30, 1886. He acted as president of the European Mission, traveling through France, Switzerland, Germany, Denmark, Sweden, Norway and the British Isles. Feeling he could not reach enough people through his preaching, he published the tracts, "Glad Tidings of Great Joy," and "The Restoration of the Everlasting Gospel," thousands of which were distributed by missionaries in the world. He died June 20, 1907, in Salt Lake City, Utah. This page was last edited on 19 December 2013, at 11:23.